All the garden trellis fencing featured on this page are available from stock with delivery in 2-5 working days. 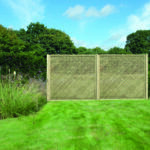 Basic trelliswork panel for fitting to walls, adding height to fencing or for use as stand-alone fencing. 6 ft wide panel for adding height or decoration to existing fence. Can be used as stand-alone panel in 6 ft high variant. 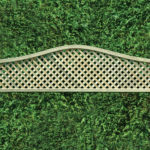 Decorative diamond lattice panel for additional height or stand-alone feature fencing. 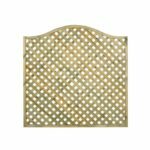 Decorative panel ideal for adding additional height to your boundary. This trellis is 1.8m in width. To fit a 6ft gap, use the Euro packing strips on either end to extend the panel to 6ft in width. Heights shown are to the highest point, the top. The sides will be 150mm (6 inch) lower. Omega top diamond lattice, fully tanalised. Available in 30cm to the shoulder, with the centre being 41cm. Omega top Privacy diamond lattice, fully tanalised. 20mm Hole compared to the 40mm hole on normal diamond trellis for added privacy. Available in 30cm to the shoulder, with the center being 41cm. 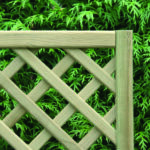 Corner section ideal for use on a gazebo or pergola. Measures 45 cm x 45 cm. 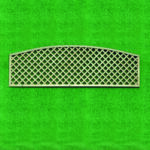 Garden lattice is a great way to add some additional decoration to your garden. These panels can be bolted to walls or fence faces to create climbing opportunities for plants, areas can be partitioned off with privacy panels for seclusion or hiding composting areas and fence tops can be easily enhanced to create nice shapes using alternating bow top and dome topped trellis. Garden trellis fencing isn’t all about looking good. You can add privacy and additional security to your property by adding lattice to fence tops. Adding a bit of latticework can easily increase your fence height and cut out prying eyes. 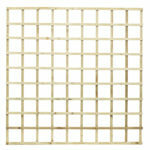 We have lattice panels suitable for most uses. If you are looking for a budget option try our cost effective square trelliswork panels . If decoration is key opt for diamond trellis, we have several styles of lattice top that can be mixed and matched to great effect. All our trelliswork fencing is stocked year round. All of the diamond lattice uses tanalised/pressure treated timber in their construction, guaranteeing long life and durability. Our panels are all 6ft wide and come in various heights from 1ft through to 6ft suitable for most circumstances.